So I Married A Craft Blogger: Poll: How Many Boxes Will It Take? Poll: How Many Boxes Will It Take? There are two facts that I'm distinctly aware of at the moment. Fact One is that Mandy has a lot of craft stuff. Some of you might remember my concern that she was a hoarder and my efforts to help her reorganize her craft room. That was in July of 2012. Two years ago. And about six posts ago. Let me tell you: a lot can happen in two years. And even more craft stuff accumulation can happen in two years. Fact Two is that we're moving. In about two weeks. We've been sort of packing and purging for a couple of weeks now, but we haven't touched the craft room. And that worries me. We have to take the craft room stuff that survived "The Great Craft Room Reorganization of 2012" and all the stuff that's found it's way into that space and move it. I asked Mandy how many boxes she thinks it will take to pack all the stuff in her craft room and she thought for a second and threw out the number 20. Then she paused and asked what size of boxes we were talking about and if we were counting the stuff that's already packed. I think 20 boxes may be about right, if they were refrigerator boxes. Unfortunately, we don't have refrigerator boxes. Even if we did, I don't think I could lift a refrigerator box full of fabric. Packed fabric is surprisingly dense. So I'm taking a quick poll. 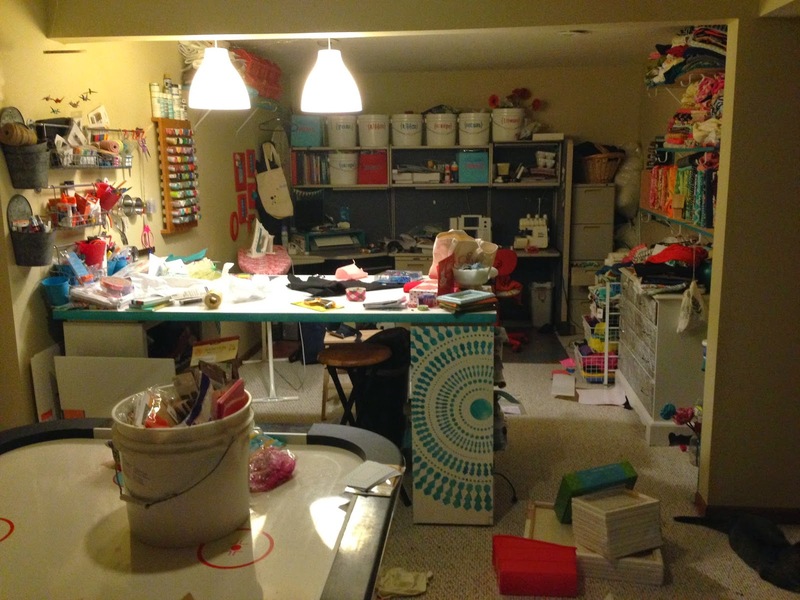 Here's a candid, unprepared snap shot of the craft room in its current state. How many "normal size moving boxes" do you think it will take to move her out? Let me know in the comments below. Whoever is closes gets to help load the truck. well, the stuff in the 5 gallon buckets won't need a box, nor will the stuff in movable storage such as file cabinets and dressers. The stuff in the desk can move in the drawers.... so, gonna go with 13. Hmmm I think 14. There are many things there that won't need a box.